Simply put, dry shampoo improves my quality of life.. exponentially. I drown myself in it weekly, in a lazy attempt to squeeze every ounce of longevity from my hair before having to wash again. And I know we all swear by it when it comes to travel. Have you ever stepped off a 14 hour flight looking a like greasy, hot mess only to discover it’s 8am local time and you can’t check into your hotel for 7 hours? What is the only thing that will save in this instance? You guessed it, dry shampoo. Davines is a sustainable hair care company that sets the bar high when it comes to eco-friendly packaging, community outreach and environmental accountability (read more about their efforts in my related post below!). Not only are they a company with ideals worth supporting, but they also create incredible products. 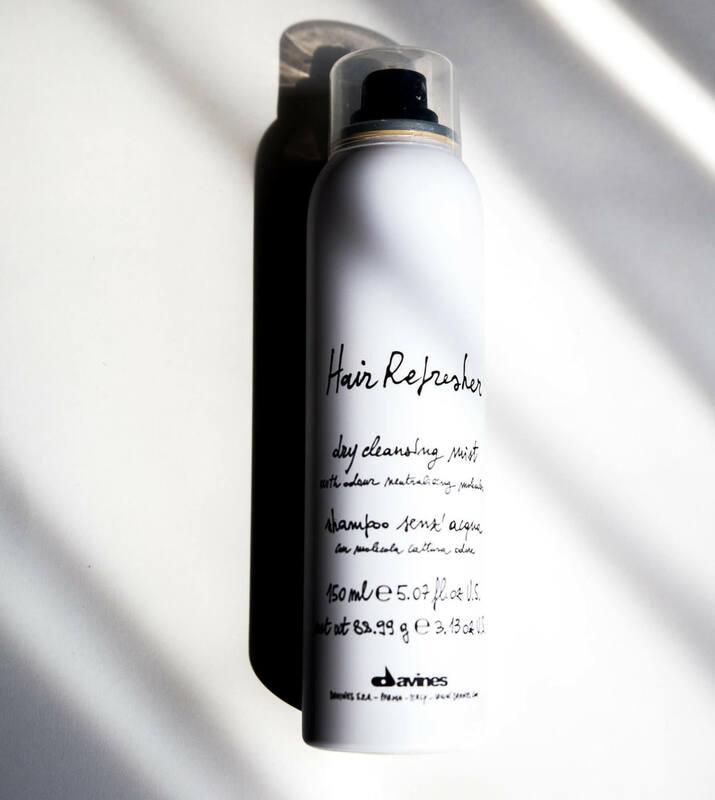 The Davines Hair Refresher is a dry shampoo that effectively eliminates oil, leaving your hair feeling clean with an added touch of volume at your roots. Keep reading for a full review of my new favorite dry shampoo. MY HAIR TYPE I have medium textured, full hair that’s wavy (when I let it air dry). My oiliness fluctuates depending on how much I work out. Sometimes I get greasy after 2 days, sometimes it takes 4-5. I have medium blonde, balayage colored treated hair with natural light brown roots. Most of the dry shampoos I’ve used in the past end up feeling heavy and sticky at the roots. While they do eliminate oil, I never love the gritty texture and buildup that seems to go hand in hand with this type of product. 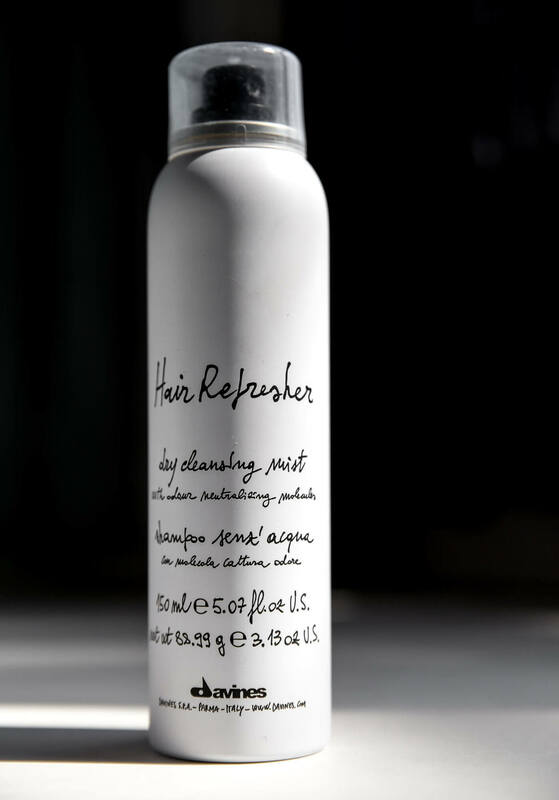 Davines Hair Refresher is formulated with rice starch, lemongrass oil and Yuzu / lemon extract, and it is the first dry shampoo that I’ve ever tried where my hair actually felt clean after using it. It eliminates oil while still feeling very weightless and light. Initially, the Davines Hair Refresher applies white and powdery, but it’s super easy to brush out and it doesn’t leave a white cast on my hair. I have not experienced any fallout but if you use your hands to shake out the product when first applying, make sure to wash them because the powder does transfer onto whatever you touch. When you first spray the dry shampoo it gives your roots a slightly matte finish, but once the powder wears down a little it ends up looking very natural, like freshly washed hair. I usually need dry shampoo on the 3rd day after washing the Davines Hair Refresher easily carries me into the 5-6th day without the need to re-apply. I have even gone longer than that and used Hair Refresher on 7th day hair. I was surprised at how well it eliminated the the oil at my roots, and if my gross, piecey ends didn’t give me away I could’ve gone much longer without washing. I know you know it. The only thing stopping me from living happily ever after with the Davines Hair Refresher is the price. At about $30USD per can for 150ml, it definitely sits on the pricer side for a dry shampoo. I would definitely still buy the Davines Hair Refresher and keep it around for days when I actually care about what my hair looks like. Then I would use my B-squad, cheap dry shampoo for all the moments in between, like when I’m running errands but still want to look semi-presentable. That way I can extend the lifespan of the Hair Refresher and not have to re-purchase so regularly.. since I go through dry shampoo at lightning speed. I haven’t finished this bottle yet but I will update this post once I do, so you can get a good idea of how long it you can expect the product to last. 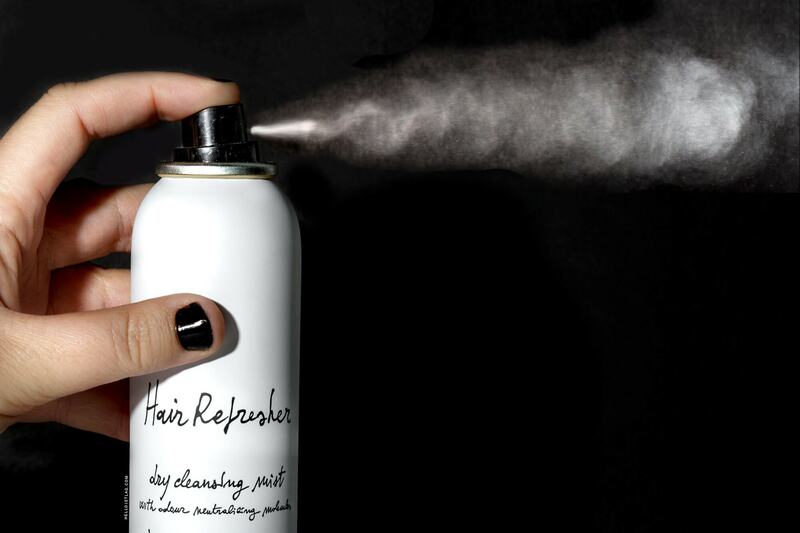 The Davines Hair Refresher is my favorite dry shampoo that I’ve tested to date. I would definitely recommend it if your budget allows. The can is a great size for travel, but is slightly too large to carry-on so if you’re flying, you’ll have to stash it in your checked bag. Butane, propane, isobutane, orzya sative (rice) starch, cyclopentasiloxane, alcohol denat., phenyl trimethicone, citronellyl methyl crotonate, fragrance, silica silycate, limonene. DISCLAIMER: I was provided with a press sample for content consideration. This post is not sponsored and sending me products does not guarantee a review. This post does contain affiliate links which means if you click them and buy something, I receive a small commission which goes toward helping me run this site. Thank you for your support! !